With this mild fall weather, I haven’t been able to wear my puffer vests near as much as I would like! Luckily today was a chillier day so I could finally wear one of my favorite puffer vests! 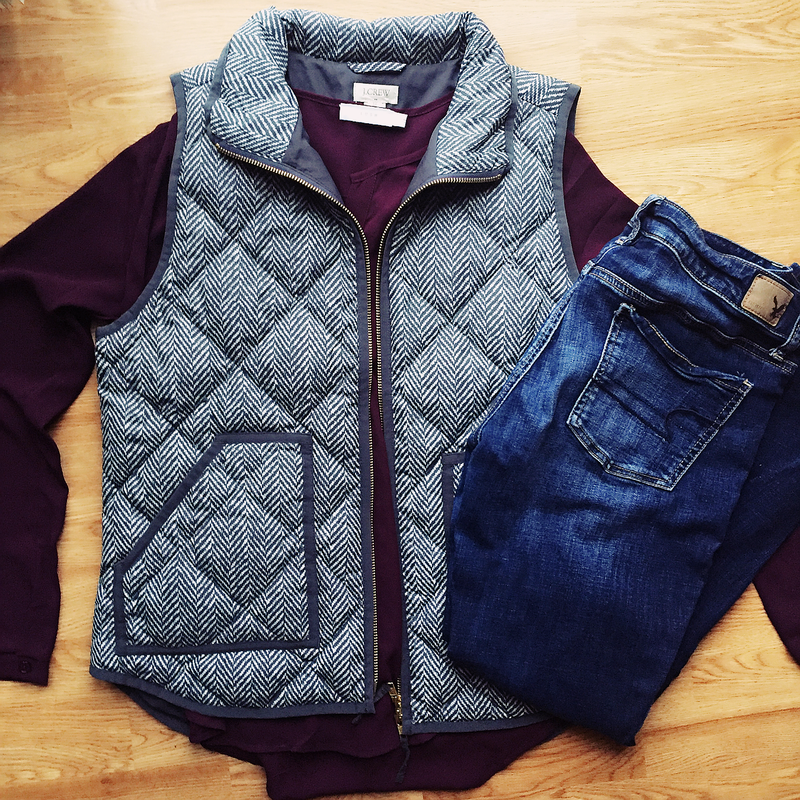 I love this classic herringbone vest because you can wear it with so many different looks. Today I decided to wear it with a wine colored top and a black skirt. I love how this look turned out and the color combination of it! This is my first skirt from J.Crew Factory and I love how it fits. I want to get this skirt in more colors because it fits so well and is very comfortable as well. Today was cold and raining so I wasn’t able to get a good picture of me in my outfit. I still wanted to share with you my outfit so I decided to take a picture of it laid out. Even though it wasn’t the best weather I still had meetings so I wanted to look nice and put together. I went with a J. Crew vest because they are great at keeping you warm but still look good. I also wore my black Hunter rain boots since I was walking around campus and I didn’t want my other shoes to get wet. I love my Hunter boots because I feel like they still look cute with most outfits! Today we’re going to be sharing with you how to take some of your wardrobe basics from day to night. Many of us have those days where we work and then have plans for the night with not much time in between. We’re going to show you a couple different ways you can quickly transition from day to night without completely changing your whole look. Both of our looks are centered around two wardrobe basics, a pencil skirt and blazer. The pencil skirt (basic skirt) and blazer (basic blazer) we’re styling are both from Byer California. Byer California has a line called Byer Basics that features four pieces. The four wardrobe basics in this line are great pieces that you can easily style from day to night. Makeup- Do a bolder lip for the night or make your eyeshadow darker. Shoes- Go from a pair of flats to a pair of booties or heels. Shoes can really change your whole look up. Accessories- Add a cute belt, hat, scarf, etc. You can really transition your look from day to night by simply adding even just one accessory piece. Jewelry- Simply switch up your jewelry. 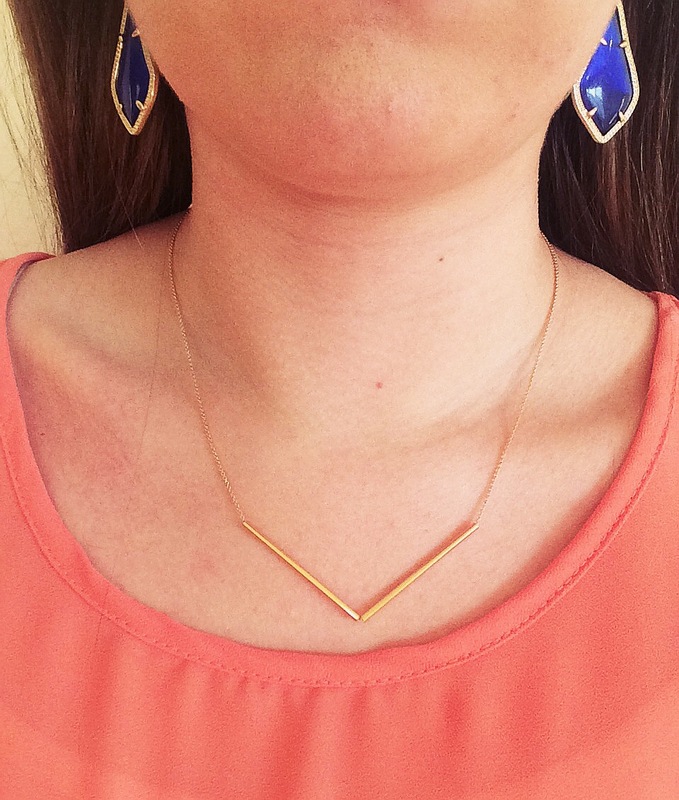 Most of us probably wouldn’t wear the exact same jewelry to work as we would for a night out. Clothes- Choose one or two clothing items to change. For example, in our looks, Rachel changed her top and Michelle changed her tank top and pants. If you’re interested in Byer California, be sure to visit their website here. If you use the code 2classysisters you’ll enjoy 20% off your purchase at checkout! Byer California is also doing a giveaway that starts today on Instagram. Be sure to follow ByerCalifornia on there so you have a chance to win this awesome giveaway! We would love to know how you transition your outfits from day to night! Let us know in the comments below! It’s a nice day today and since I have to work, I decided to wear one of my new skirts! 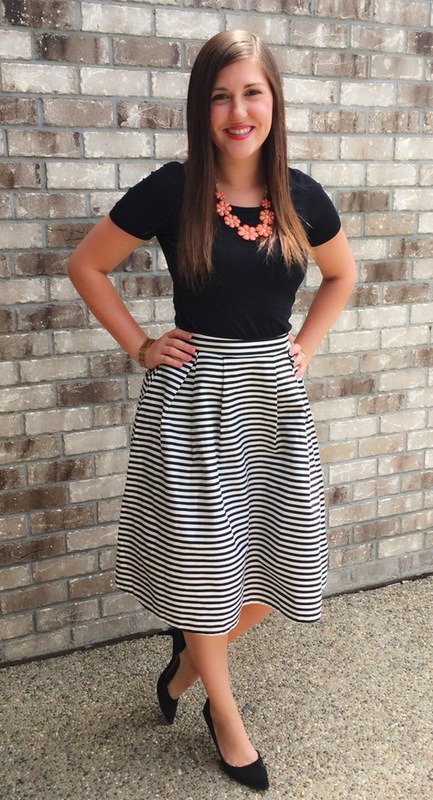 I got this skirt on sale on Red Dress Boutique for only $15, such a steal! 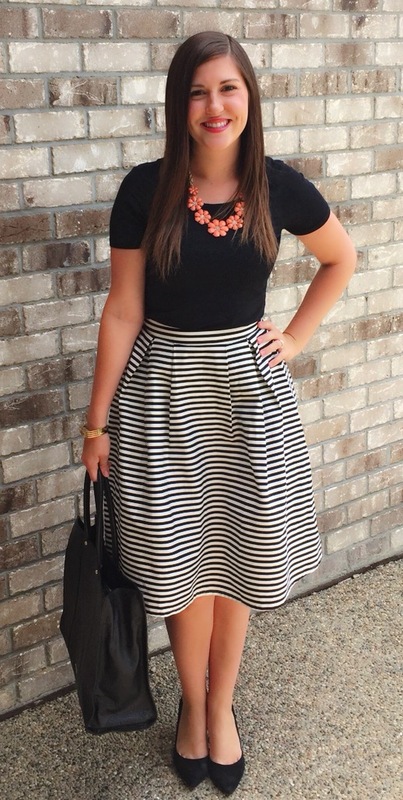 With this outfit being black and white, I went with a bright coral necklace to add a little pop of color to the look! I love this classy look for a day at work. With Fourth of July coming up this weekend, we decided to do a look book for the holiday instead of our usual ‘What We Wore Wednesday’ post. We’ve put together multiple looks, using clothing from our everyday closets. Since we used clothing from our closets and didn’t buy clothing that would only be good for the Fourth of July, these looks can be worn any other day as well. If you haven’t figured out what you’re wearing yet for the Fourth of July, we hope these looks will give you some inspiration! I have now started work for the summer, which means during the week I have an excuse to dress up now! For work during the summer I love to wear dresses and skirts! 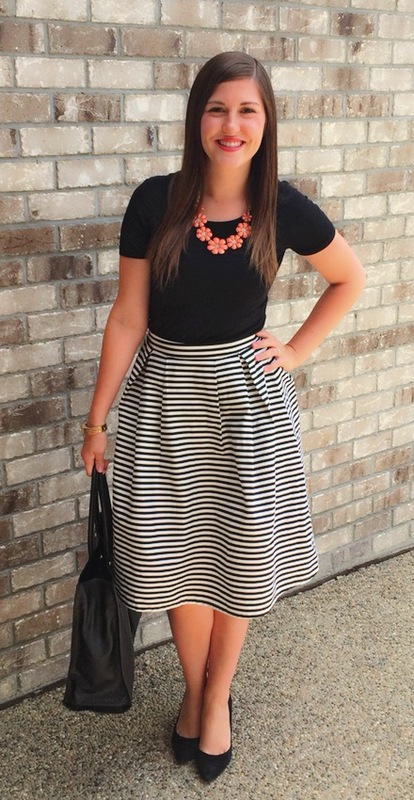 This skirt is one of my favorites. I like the shade of pink that it is and also the length is great for work. Even though it was nice out yesterday, it still gets a little chilly in the office. I decided I wanted to wear my J. Crew chambray shirt since the sleeves can be long or rolled up. I go back and forth between wearing flats and heels at work, but since I knew I would be running some errands I decided to go with my favorite pair of sandals. Yesterday I spent the day running errands and doing a bit of shopping. I’ve been wanting to wear this romper ever since I got it. I decided yesterday was a good day to wear it because it was pretty warm and this romper is really comfortable for running around in. I just bought these wedges last week from Target and thought they would look perfect with this romper as well. 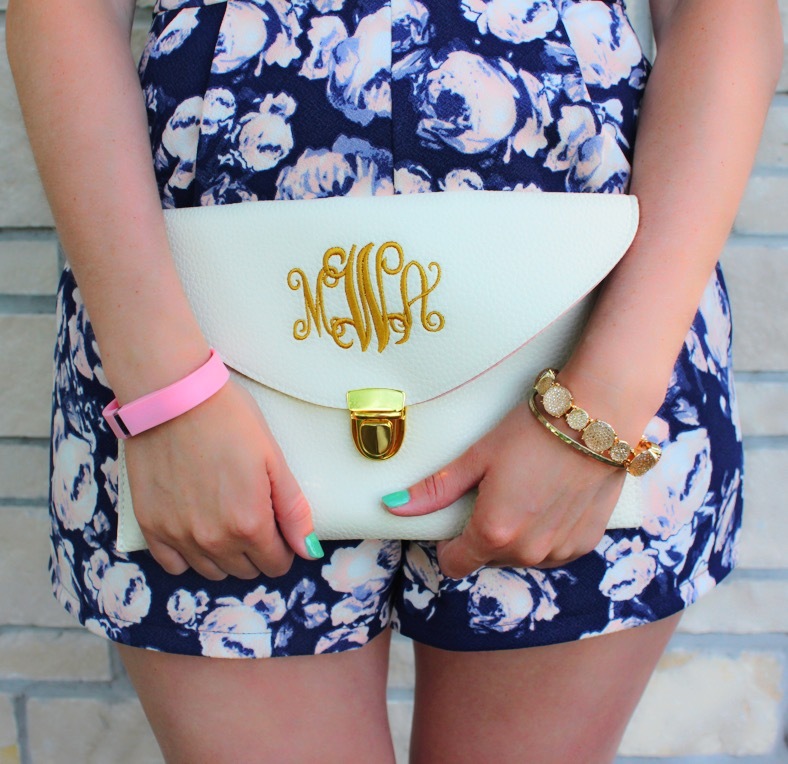 I finished off the look with some gold jewelry and my Marley Lilly clutch. We hope you enjoy the rest of the week! We were lucky enough to team up with Ooh La Leggings to style a couple of their leggings and share with you how great they are! Ooh La Leggings is an online website that has a variety of leggings, from patterned ones to solid ones. These leggings are one size fits most, so you don’t have to worry about which size to order. Ooh La Leggings retail for $21.00, which we think is a very reasonable price! We each chose a pair of leggings to style and review for this post. Packing Fashionably & Efficiently For A Trip Abroad! Coming up I have a 15 day study aboard trip where I will be going to Spain and France. One of the biggest stresses of going abroad can be packing for your trip. However, this is my 6th time going abroad so I have picked up some tips & tricks to make it as easy as possible! 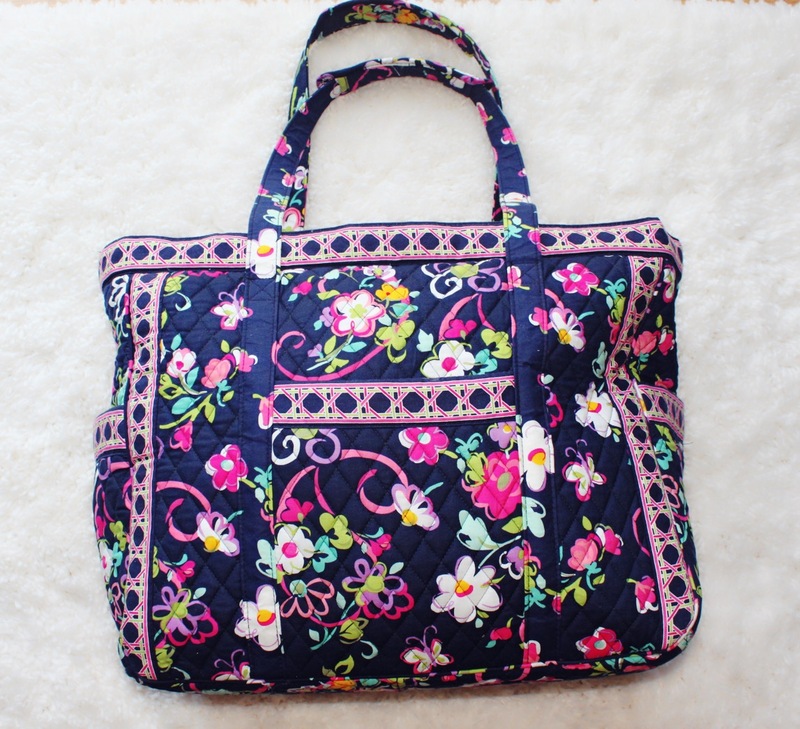 Since I am only going to be going for 15 days, I am bringing a large suitcase to check, my Vera Bradley Weekender for my carry-on, and my Longchamp bag for my personal item to keep under the seat ahead of me. Depending on how long you are going, you might be able to get by with a little less or you might have to bring another suitcase. I definitely could get by with bringing a smaller suitcase to check. However, I want to make sure I have room to buy things while I am abroad. When it comes to purchasing a suitcase, I encourage you to buy one in person so you can “test it out” and see if you like it. When buying a suitcase, make sure you have an idea of the size you are looking for. This is especially important if you are buying a carry-on suitcase since there are size restrictions. I got mine at TJ Maxx and it’s a Swiss Gear suitcase. 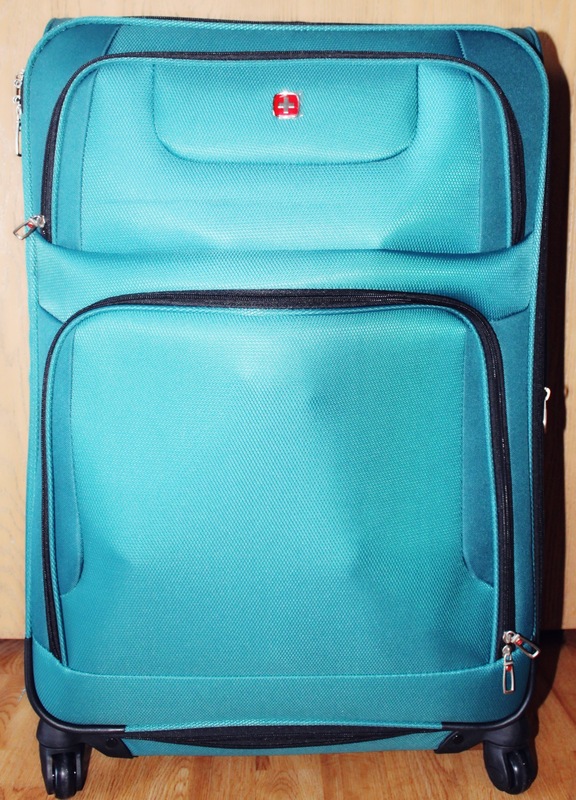 TJ Maxx is a great place to get a suitcase because they have some great brands at a discounted price. I don’t think it’s worth it to get expensive suitcases when it comes to checked bags since sometimes they can get beat up when getting loaded/unloaded. 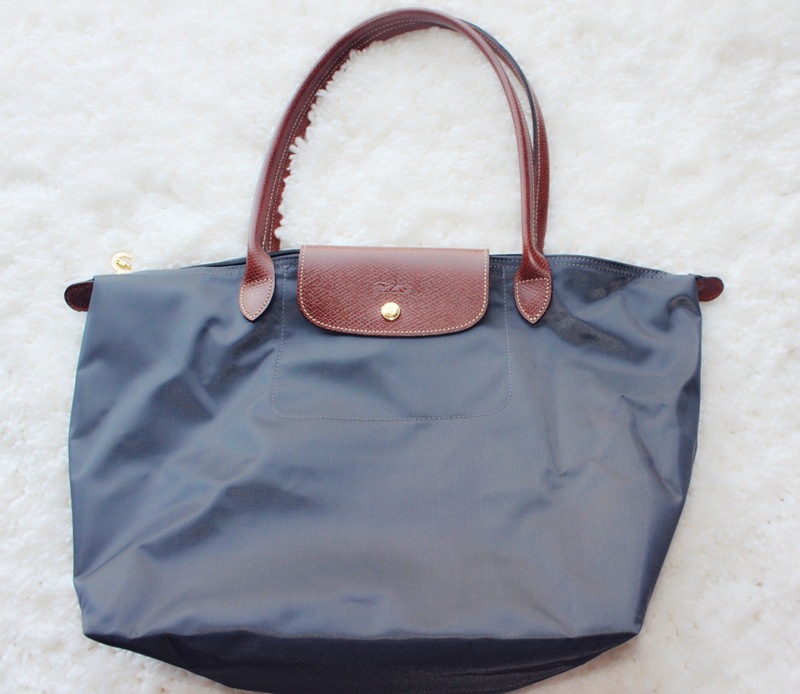 When it comes to what style of bag you get, it’s up to you! I like the fabric suitcases over hard cases because I feel like I can’t fit as much into the hard cases. I also prefer the four wheel suitcases. I think it makes it easier to get around the airport with them. Make sure when you are looking at suitcases to check out the wheel and see if they all roll properly. When you decide to go abroad make sure the first thing you do is GET A PASSPORT! If you already have a passport make sure you check the expiration date to see if it will be good throughout your trip. While abroad you will usually have your passport on you at all times. Because of this, I like to have a cute passport holder. 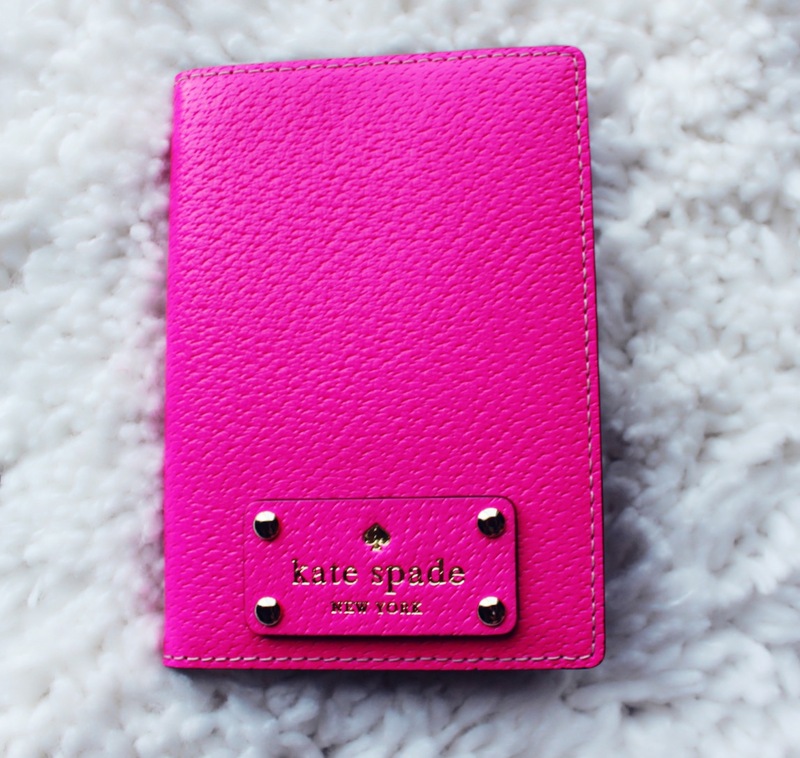 I use to have a cheap one from Target but just upgraded to a Kate Spade one thanks to my mom! You don’t have to get a passport holder. I just think it makes it easier to keep track of your passport by adding some color to it. Another important thing to know when going abroad is what type of currency do they use. Since I am going to Spain and France I had to get Euros to bring along. I suggest getting some before you leave at a bank. However you can also exchange money to the correct currency when you get there. Make sure to call your debit/credit card company before leaving and let them know how long you will be gone, along with what countries you are planning on going to. If you don’t do this the debit/credit card company might think that your card is stolen and shut off your card making it so you can’t use it. It is also suggested to bring a copy of your passport with you in case you lose yours to help with the process of getting a new one abroad. I also think it doesn’t hurt to leave one back home with someone as well. I also like to bring with me a copy of my itinerary if you have one, along with all of the hotels you are staying at with phone numbers and addresses. Author 2classysistersPosted on May 28, 2015 May 27, 2015 Categories STYLETags americaneagle, Bose, Dry Goods, Europe, fashion, Fashionista, Francesca's, Headphones, ipad, Iphone, J. Crew, jcrew, Kate Spade, Kindle, Longchamp, monogram, Packing, Passport, Passport Holder, PINK, Spain, Sperry Top-Sider, Study Abroad, style, target, Tobi, Tory Burch, Travel, Travel Abroad, Travel Prep, Vera Bradely, VSPINK6 Comments on Packing Fashionably & Efficiently For A Trip Abroad! As you might be able to tell from my picture I’m back at school. I’m back for a week taking a course, which is in preparation for a short study aboard trip that I’m going on next week. Of course it was raining for most of the day. I feel like Michelle and I can’t catch a break with the weather when we do our What We Wore Wednesday posts. I decided to go with this outfit since it’s cute, yet still comfortable for sitting in a classroom for four hours. I also chose this since I had to run a few errands after class to prepare for my trip and I wanted to look a little nicer for going out and about. Last week it was cold and rainy most days and this week it finally warmed up! To celebrate the warmer weather being back I wanted to pick an outfit that included a bright spring color. 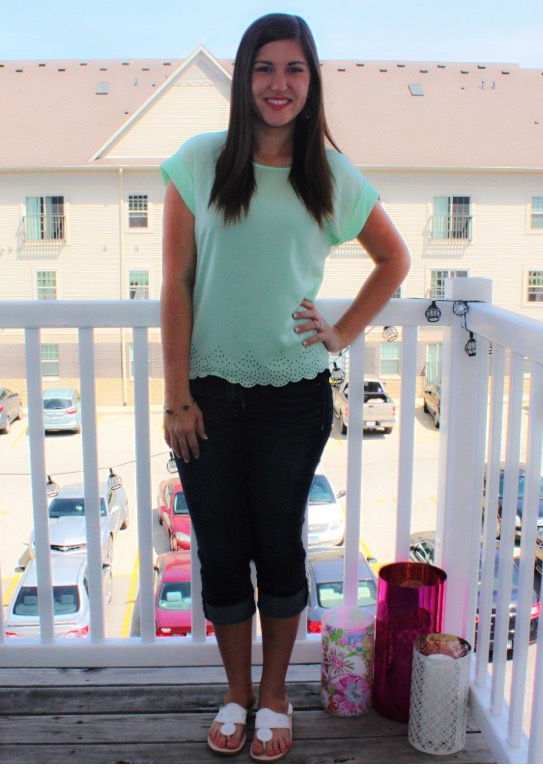 I decided to go with one of my favorite new pieces, a minty blue scalloped top from J Crew. I love this top because even though it’s simple the bottom still make it fun! Since it was warm outside but still not hot enough for shorts I went with one of my go to capris from American Eagle. To complete my outfit I went with my white Jack Roger sandals. My bracelet and earrings are both from Rocksbox. I don’t wear a ton of bracelets since I usually have my Fitbit on but I love this Margaret Elizabeth bangle and I’m excited to be able to style it a few more times before having to send it back. 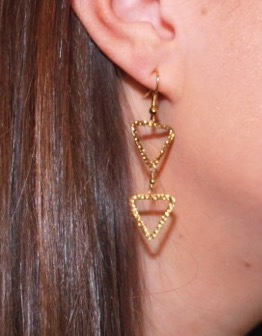 My earrings are Charlene K and the were my favorite piece I received in my Rocksbox. They are so lightweight and I love that they can go with so many different style of outfits. 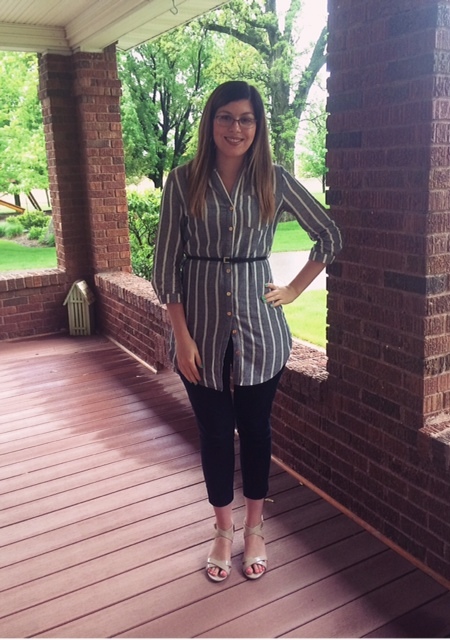 Until Summer vacation hits, these posts will be featuring my outfits I wear for work. 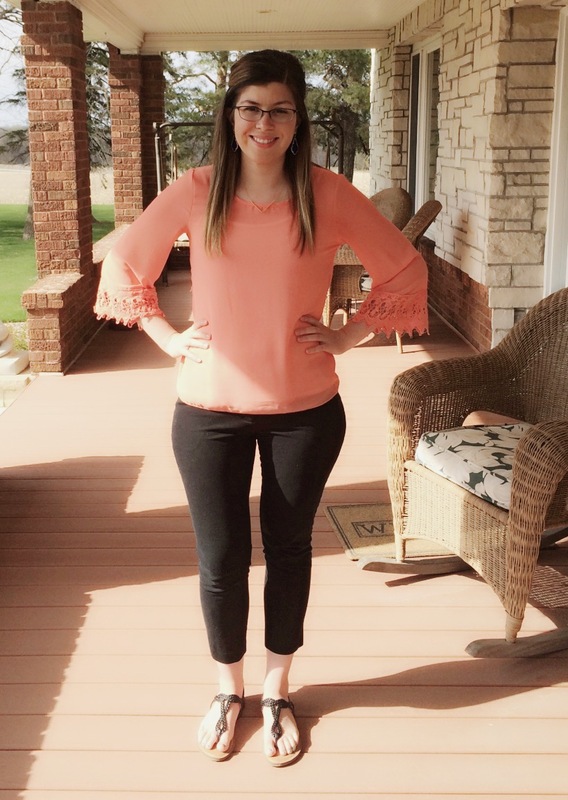 I had been waiting for a nice spring day to wear my new Francesca’s top that I got earlier this spring and yesterday ended up being a good day for it. I also thought this top went perfectly with the Kendra Scott earrings. 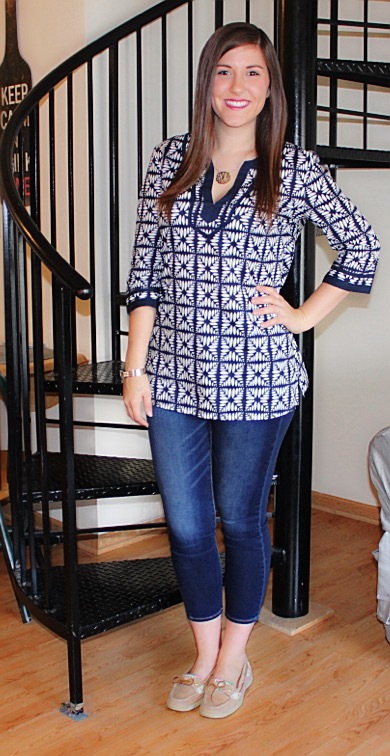 I then decided to pair this top with one of my favorite pair of dress pants to wear when it’s warmer. I got these black pants from Target a few years ago and they are so comfortable! I really like how they fit. I wish I would’v gotten a few more pairs in black. 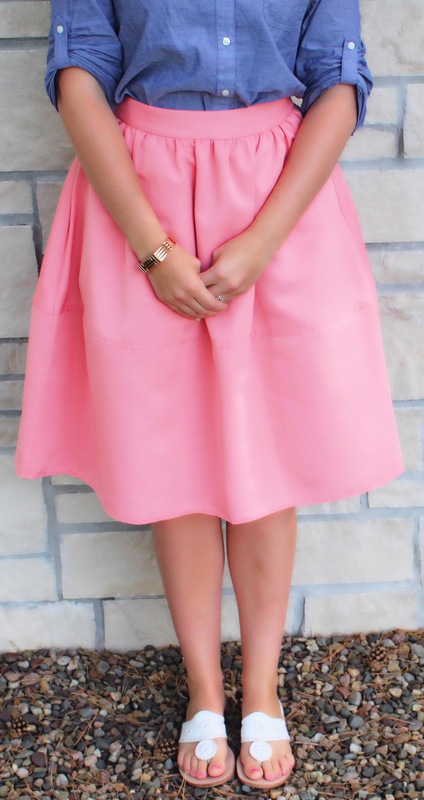 I finished off my outfit with some new black sandals that I also got from Target. I believe these sandals were only around $16 and they had them in multiple colors. 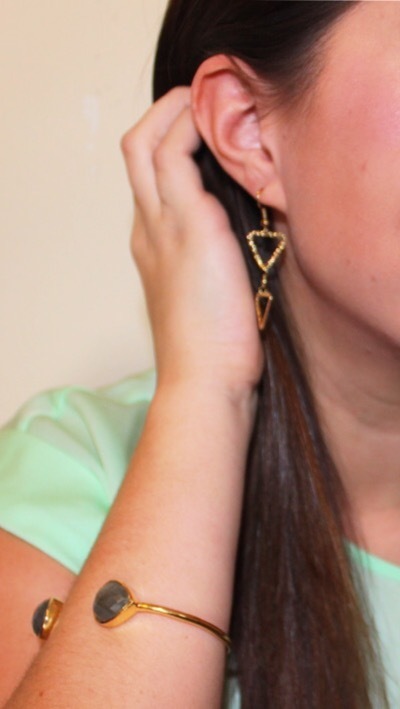 The earrings and necklace I’m wearing are both from my Rocksbox. 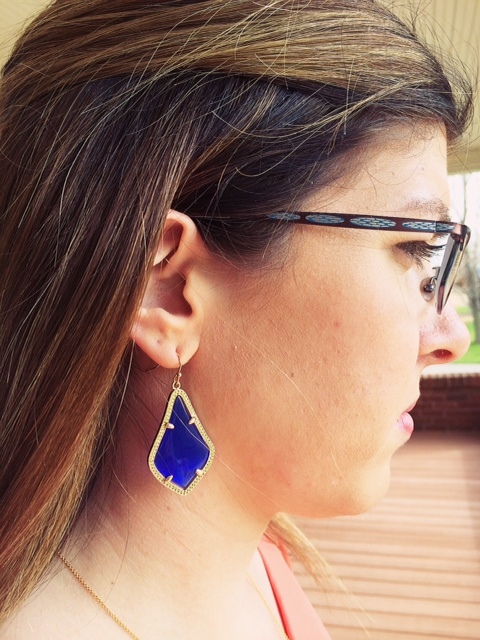 I really like the Kendra Scott earrings and the color of them. However, I will be sending them back since I don’t know if I would get enough use out of them. When I originally saw the necklace in its packaging I didn’t think it looked like something I would like, but I was pleasantly surprised when I put it on. I absolutely love it and I’m debating about whether or not I should keep it! If you’re interested in trying Rocksbox, we have a code for you that will get you your first box free! This is a great deal since Rocksbox is $19 a month. Use code: 2classysistersxoxo. For those who don’t know what Rocksbox is and how it works, here a quick run down. Rocksbox is a subscription box. Once you have signed up, you get three pieces of designer jewelry in each box you receive to wear on loan. The jewelry is picked for you based on a style survery you take and the items you add to your wishlist. After you have worn the jewelry as much as you want, you then return the three pieces of jewelry anytime to receive three new items. If you fall in love with any of the pieces, you can buy any of them from your Rocksbox set.